Today I’m joining in with my friend Jane from Mama Pea Pod with her regular Outdoor Play linky. Jane lives in Hungary (how cool is that?!) and the weather is getting warmer there, while it is getting much cooler here. We have, however, had a little bit of sunshine over the last few days which has been glorious. Sometimes, you just can’t tell when something is going to capture your child’s attention. You can spend a long time setting up activities but they play with it for 2 minutes and they’re on to something else. Yesterday we struck a winner when I suggested, in a flippant attempt to get the kids out of my hair, that they go & hide their toy cars in the garden in a twist on ‘hide ‘n’ seek’ and they played for what seemed like hours. You just can’t predict these things. Can you spot the cement mixer in the picture below? Where have you been outdoors this week? This week’s easy peasy dinner winner is Taco’s. Of course the easiest option is to buy a packet of taco seasoning, but one day I hadn’t bought any and knew there must be a DIY alternative out there. So, I did what I always do and googled it. This version only takes a minute or two anyway. If you want it a bit spicier – add some cayenne pepper. 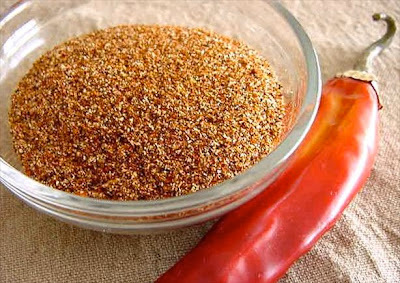 If you want it less spicy, omit the chili powder. You can keep this in an airtight container in the cupboard for whenever you need it. When I need it, I add it to 500g beef mince and a chopped onion. The favorite in our house is to use soft tortillas for tacos. These are delivered each week in our Aussie Farmers delivery (Our shelves would be bare without Aussie Farmers!). I also use tortillas for lunch wraps, as pizza bases or for thin toasted sandwiches. and everyone makes their own. It’s often a big mess and the cheese gets eaten first, but some of the vegies do manage to go in at some stage. In some more than others. After being inspired by seeing some great easy peasy desserts on many of your blogs and realising that, unlike me, many people do have dessert after a meal more than once a month, I’ll now be including a quick dessert every now and then on a Tuesday. So, feel free to link your easy peasy desserts as well as your easy peasy meals each week. The following is one I have been known to do when unexpected guests arrive…tastes divine. Came from the Donna Hay ‘Food Fast’ cookbook. Another title I like! Preheat oven to 220C. 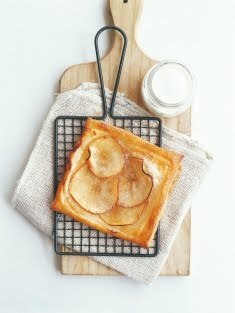 Cut each pastry sheet into 2 pieces. Core the apples and slice thinly. Place the pastry on baking trays lined with baking paper and top the pastry with a layer of apples down the middle. Brush the apples with melted butter and sprinkle with brown sugar. 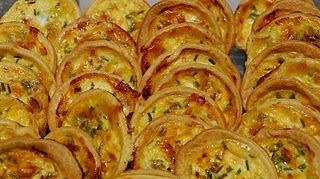 Bake in the oven for 12 minutes or until puffed and golden. Serve with thick cream or ice-cream. Take a photo of your dinner tonight, or sometime this week, & link your easy peasy recipe down below, so that we can all give it a go. Don’t forget to link back to here in your post so others can join in the fun and have access to some great new easy dinner recipes. Alternatively, feel free to just link up an old post that you’ve written if it contains what we’re after. Remember – no dinner is too easy! Bring on the easy peasy desserts as well – yum! Got this quick & easy vegetarian curry recipe from my sister quite a few years ago. Back when I, who hated cooking and had a VERY small repertoire, needed some easy recipes to pop on the table. Being forced to cook a meal every night for kids has given me a whole new confidence in cooking – forced experience really. My (slightly annoying) children don’t like the same meal to be repeated within a two week period, so I had to move beyond the tuna casserole (learned in Home Economics in year 10) & spag. bog. every few nights. I, unfortunately, don’t actually make this one any more because none of my kids eat pumpkin any more. None of them. But they all love pumpkin soup – what is with that?! 1. Heat oil in large frying pan. Add cumin, tumeric & garlic and cook for 2 minutes. 2. Stir in diced pumpkin, potato, lentils and tomato pieces, combining well. Cover & simmer over a low heat for 20 mins or until pumpkin & potato are cooked through. 3. Add coriander leaves and salt to taste and serve immediately. On individual plates arrange the corn chips and sprinkle grated cheese over. Microwave each plate on high for 30secs or until cheese is melted. 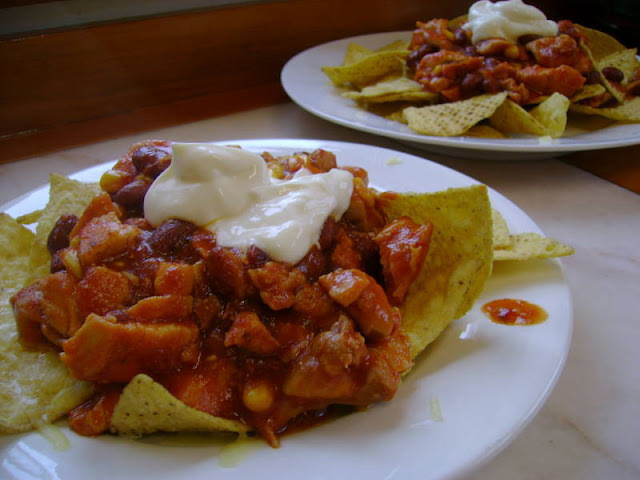 Spoon chilli mixture onto chips and top with a blob of sour cream. Enjoy the fact that you have a delicious meal full of goodness ready in 10 minutes flat, fifteen tops. Simoney’s blog is always full of honest, down to earth posts about herself & her family. She also runs Kids Click which is well worth a look if you parent some budding photographers! Next week I am hoping to set up a linky to this post, so think about those easy dinner recipes that you whip up every week, pop it on your blog and link it up next Tuesday! For more easy peasy dinner winners click here.